This stainless wire rope is made with 7 individual wires to make up a single strand and then 7 strands are brought together for better strength. 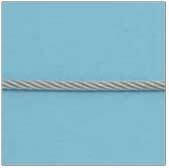 Uncoated Stainless Steel Cable (wire rope) is strong, lightweight and corrosion resistant. Uncoated Stainless Steel Cable is a commercial quality in terms of size, flexibility and minimum breaking strength. The wire is oil free, polished and supplied on wooden or plastic spools. As always, the (316 Stainless) stainless is a good match for saline and wet environs.